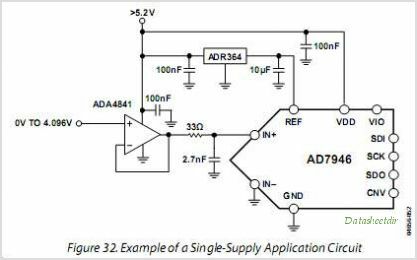 The AD7946 is a 14-bit, charge redistribution, successive approximation, Analog-to-digital converter (ADC) that operates from a single 5 V power supply, VDD. It contains a low power, high speed, 14-bit sampling ADC with no missing codes, an internal conversion Clock and a versatile serial Interface port. The part also contains a low noise, wide bandwidth, short aperture delay track-and-hold circuit. On the CNV rising edge, it samples an Analog input IN+ between 0 V to REF with respect to a ground sense IN. The reference voltage, REF, is applied externally and CAN be set up to the supply voltage. The SPI-compatible serial Interface also features the ability, using the SDI input, to daisy-chain several ADCs on a single, 3-wire bus, or it provides an optional BUSY indicator. It is compatible with 1.8 V, 2.5 V, 3 V, or 5 V Logic using the separate supply VIO. The AD7946 is housed in a 10-lead MSOP or a 10-lead QFN (LFCSP) with operation specified from 40C to +85C. This is one package pinout of AD7946,If you need more pinouts please download AD7946's pdf datasheet. This is one application circuit of AD7946,If you need more circuits,please download AD7946's pdf datasheet.